Governor Jerry Brown announced that he has just signed a bill—SB 969—that will permit the sale of banh tet and banh chung (Vietnamese rice cakes) at room temperature. The bill was first introduced by Senator Janet Nguyen of Garden Grove. While the bill will loosen restrictions on the rice cakes, it does come with some caveats. For instance, the cakes must be labeled with the date and time that it was made. The label will also inform customers that the cake must be consumed within 24 hours of the time stamp. And the cakes must be stored at temperatures not exceeding 70 degrees Fahrenheit. Any unsold banh tet or banh chung that&apos;s gone over its 24-hour shelf life must be "destroyed in a manner approved by the enforcement agency." Actually, we had no idea that there were legal issues with banh tet. As noted at Capital Public Radio, storing and selling the rice cakes at room temperature is a violation of California health standards because the food is made with perishable ingredients. As anyone who&apos;s ever eaten banh tet will tell you, refrigeration isn&apos;t an option because it turns the cake into a cinder block. Banh tet is commonly made with glutinous rice (which gets hard in the fridge), mung bean and a pork filling. The ingredients are rolled into a log-shape form and boiled. Banh chung, which is shaped as a square, is another variation. 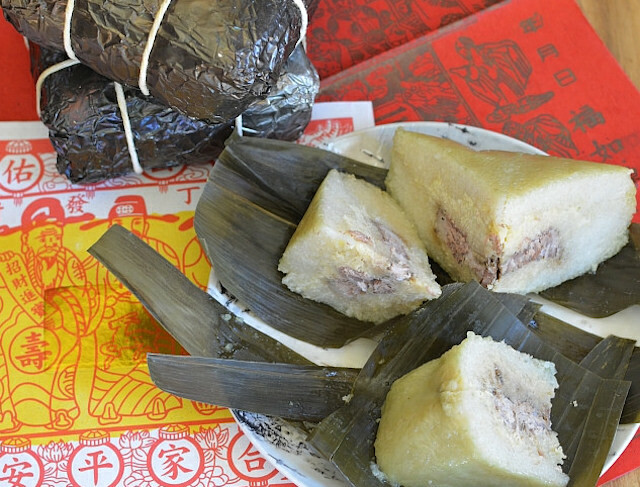 The rice cakes are more than just a snack, they&apos;ve been long associated with Tet—the Vietnamese New Year. When the new year rolls around, Vietnamese households stock up on the cakes as if they&apos;re gold bars. They&apos;re eaten around the clock—some fancy them as a breakfast food, while others prefer them as a midnight snack. You can also plop slices of banh tet onto a frying pan to give them a crunchy exterior. This cake was invented by the 18th Prince of Hung Emperor in the contest of looking for new Emperor. According to the legend, 3,000-4,000 years ago, Prince Lang Lieu, made round and square cakes, the round Day cake symbolizing the sky and the Square cake symbolizing the Earth (under the ancient Vietnamese perception), to be offered on the occasion of Spring. In the ancient conception, the Earth is square; hence this cake&apos;s shape is square, too, to reflect the Earth&apos;s shape. Since the cakes he offered were of special meaning and delicious taste, Lang Lieu was selected to be the next Emperor. Since then, in honor of this 18th Prince, Vietnamese people always make and have Square cake in the Lunar New Year. The significance of banh tet and banh chung is even more outsized for Vietnamese immigrants in America, as they also serve as a reminder of their homeland. "Vietnamese refugees have brought with them cultural traditions that have been passed down for centuries to the more than 100,000 Vietnamese-Americans living in San Jose," said attorney Jenny Do in a statement released by Nguyen. "[The bill] will create a necessary exemption in State law for our community to legally practice our traditions." Check out this video if you&apos;re thinking about making your own banh tet. And feel free to eat it at room temperature, because no one&apos;s going to stop you.